In the United States, the government agency responsible for worker safety is the Occupational Safety and Health Administration otherwise known as OSHA. OSHA’s Hazard Communication Standard, also known as HazCom, is a federal regulation (29 CFR 1910.1200) that specifies that when hazardous chemicals are present in the workplace, employees have a right to know about the risks involved with storing and handling such substances. The Hazard Communication Standard is now aligned with the Globally Harmonized System of Classification and Labeling of Chemicals (GHS) which is a worldwide standard. 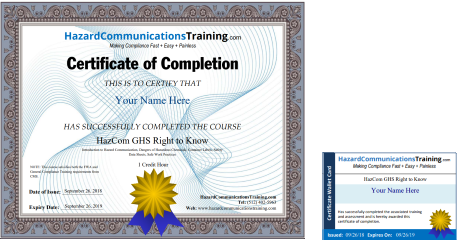 HazardCommunicationsTraining.com offers a full range of Hazard Communication (HazCom GHS) compliance products from training and certification for an individual to full HazCom GHS compliance for organizations. We specialize in helping individuals and small to midsize organizations get HazCom GHS compliant in the most affordable, fastest, and easiest way possible. Who Needs to Comply with Hazard Communication? Our Individual Training is for a single individual looking to obtain their Hazard Communication (HazCom GHS) certification to satisfy the training requirement by the OSHA Hazard Communication Standard and to provide to an employer/organization as proof of training for compliance purposes. If you are an organization looking to train your employees, please go to the Hazard Communication for Organizations section. The Occupational Safety and Health Administration, OSHA, is the government agency that is responsible for worker safety including the Hazard Communication Standard. OSHA has instituted compulsory training and compliance programs for individuals and organizations that will have workers that will be exposed to hazardous chemicals at their workplace. 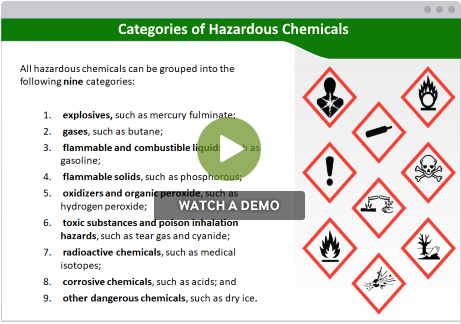 These training and compliance programs help ensure that workers are informed about the hazards of chemicals that they are or will be exposed to. Hazard Communication compliance for an organization revolves around putting in place compliance programs and training to ensure that workers are informed and all pertinent information is clearly and effectively communicated about hazardous chemicals that they may be exposed to in the workplace. As part of satisfying the Hazard Communication compliance requirements established by OSHA, employers are required to provide a Hazard Communication (HazCom GHS) awareness training to workers when a worker is first placed into a job that entails potential exposure to hazardous chemicals, when new hazardous chemicals are introduced, etc. Our Organizational Training is for an organization looking to train its employees on Hazard Communication (HazCom GHS) and obtain their Hazard Communication certification for them for compliance record keeping. We are the leader in user friendly Hazard Communication training and compliance and our mission is to make Hazard Communication compliance fast, easy, and painless. We've done all the hard work so you don't have to. 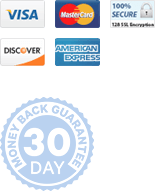 We hope you'll give us a try and in return we promise exceptional training and compliance products at an affordable price and to treat each of our customers with the utmost care and raving support. Training and compliance for the U.S. federal OSHA Occupational Exposure to Bloodborne Pathogens standard (29 CFR 1910.1030) which protects workers against the health hazards from exposure to blood and other potentially infectious materials.